Sharp spikes cover these large Heartless. Though they are impervious during their spin attack, you can slow their onslaught with a block, bringing them to an eventual halt. Alternatively, Thunder magic will stop them with a single blast. The Spiked Crawler is an Emblem Heartless that is found in Kingdom Hearts 358/2 Days. It is one of the bosses in Agrabah. A Spiked Crawler has a black, spherical head with two beady, yellow eyes on it. It wears a conical, black helmet with an angular antenna attached to its tip and a silver brim. The majority of its body is encased in a spherical suit of armor with eight conical, black spikes spaced evenly over its surface. This armor is primarily colored in shades of blue and white, with some red decorations on it. Its thin arms jut out of circular openings in the armor on either of its sides. Its spindly legs share a large, circular opening at the bottom of the armor, and the tips of its feet point upward. 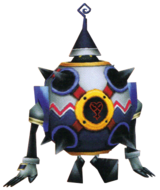 The Spiked Crawler has two Heartless emblems, on its front and another on its back, both of which are placed in the middle of a yellow ring. The Spiked Crawler's name refers to the prominent spikes on its body, and its normal method of movement when not spinning is a slow crawl. The Spiked Crawler has an extremely high Defense stat, so it will take some time to defeat. When it starts spinning, immediately bombard it with Thunder magic until it hits. This will stop the Spiked Crawler in its tracks, enabling Roxas to damage it. Thunder can also take a toll on the Spiked Crawler's HP. In Story Mode, Xion will finish off this Heartless halfway through the battle against it, but it will not drop any items or munny. The full battle against the Spiked Crawler can only be accessed in Mission Mode. Concept art of the Spiked Crawler. This page was last edited on 3 May 2018, at 21:27.